129 audiovisual spaces, extensive training rooms, meeting rooms, board rooms, conference rooms, huddle rooms, classrooms, broadcast rooms, and state-of-the-art visualization and simulation rooms. Profile: As one of the largest energy companies in the world, BP expanded its facilities to support the company's growth. The company has built state-of-the-art executive learning centers, training spaces, offices, exploration and production research spaces, and trading floors. Services: DataCom Design provided "out-of-the-box" thinking and cutting-edge designs for two new training and conference facilities. 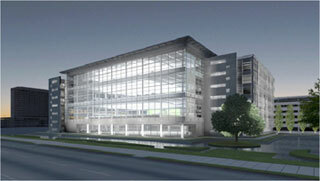 This certitifed LEED Platinum building involved the design and coordination of numerous meeting spaces that incuded PLEX™ systems which featured three edge-matched solutions that deliver a single seamless image or three separate images; allowing users to work freely with the entire space as necessary. In addition the advanced trading floor involves high density visual displays and a fully incorporated technology approach to support streaming data and video applications. The solution included the integration of IT, wireless, audio, videoconferencing, and recording capabilities.